Built-in FM transmitter, full frequency: 87.5-108MHZ. Bluetooth IC: CSR 2.1. 1PC Bluetooth Car Kit. Supports USB disk. USB Input: 12-24V. USB Output: 5V/2.1A. USB (Maximum support): 32GB. Frequency: 87.5-108.0 MHZ. Bluetooth function, transfer Calling / Music / FM /. 5% every hour low power consumption when use bluetooth play music. Music playing function, support Bluetooth Music/ USB Disk/ TF Card / WMA / MP3 format. This device plays audio from your iphone using either the lightning connector or the 3.5mm plug. Range 88.1-107.9Mhz. SNR: ＞90dB. - This car kit can be easily paired with your phone via bluetooth, lossless transmitting a digital audio signal to your car stereo or other speakers by AUX. - Built-in mic, equipped with noise-cancellation technology to provide clear, hands-free calling while you drive. Besides, during the bluetooth connecting, play the phone's music and the fm transmitter to car audio, as the calls incoming switches to the speaker state, when call ends, it will switch back to music playing. Support bluetooth hands-free phone calling via its built-in microphone. Bluetooth version: V4.0 EDR. Bluetooth protocol: A2DP. devices like MP3 player. 1x Car bluetooth device set(TF card is not included). 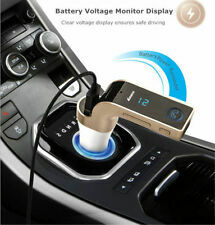 1 x Bluetooth Fm Transmitter. This device may be paired as a hands free kit with any compatible Bluetooth enabled devices. Supports music play back from USB and SD card. Switch to Hands-free mode automatically from music playing status when receiving calls. Uscita di ricarica per auto: 4.8-5.2 DCV. Si prega di consentire errori 1 ~ 3mm a causa della misurazione manuale. - Materiale: plastica. - Lunghezza: ca. 120 cm / 47,2 pollici. - Gamma di frequenze: 87,5-108,0 (MHz). Modulation mode:FM Stereo sound. - Stereo LCD Display,1W,7W power can switch use. - S/N(stereo sound):>40db. - Stereo crosstalk:-45dB(5000Hz~15000Hz). - Frequency response:40KHZ~15KHz -0.2db(stereo sound). Formato audio: MP3 / WMA / WAV / FLAC. Uscita di ricarica USB: 5V / 500mA. People always bought together with. Este gran dispositivo transmite audio desde su Phine a través de los altavoces de cualquier dispositivo de radio FM. Basta con conectarlo a la toma de auriculares y seleccione la misma frecuencia que en la radio FM. Adatto per iPhone e altri smartphone e lettori MP3 con 3.5 mm Port Audio. Basta inserirlo nella presa cuffie e scegliere la stessa frequenza della radio FM. FM completo di frequenza 87.5-108 mhz. Schermo LCD e il pulsante Quick Touch. Auricolare stereo Bluetooth fornisce una qualità audio eccellente. Versione di Bluetooth: V2.1. 1x Caricabatteria da auto Bluetooth. Umanizzato design a doppia porta USB, portando molta convenienza. Uscita USB: 5V / 2.1A. For often-used FM settings SmartScan one-button setup finds the best open. frequency for you; all you have to do is tune your radio SmartSound adjusts. Item Weight: 0.3 ounces. Bluetooth Bluetooth 4.0. Kit 1x Bluetooth FM. Profilo Bluetooth HFP, HSP, A2DP, AVRCO. FM Gamma di frequenza: 87.5-108.0MHz. Senza soluzione di continuità passare dalla chiamata in arrivo e modalità musica. Der LCD-Bildschirm dieses USB / SD / MMC-Spielers zeigt die Spur- und Lautstaerkeinformationen an. Lautstaerke Drehknopf und Netzschalter in einem Butto. Hoeren Sie Ihren Lieblings-MP3 in Ihrem Auto mit diesem Multifunktions-MP3-Player. Connessioni wireless: installate senza rimuovere il volante originale possono evitare di danneggiare il volante. 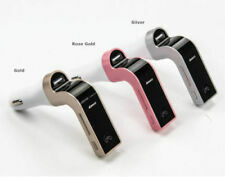 Built-in MIC, support Bluetooth hand-free function. Bluetooth stereo music play. Bluetooth 3.0. Bluetooth Version: V3.0 EDR. Support stereo sound output and FM transmission. FM: 87.5MHZ-108.0MHZ. 1x Audio Cable. FM transmission frequency: 87.5-108Mhz. Support Play format: MP3 / WMA. 1 Car Bluetooth MP3. 1 User Manual. 1 Audio Cable. Support language: Chinese, English, French, Spanish, German, Portuguese, Italian, Dutch, Swedish, Russian. (Stereo Bluetooth). Supporta vivavoce Bluetooth, microfono incorporato, sicuro e conveniente per rispondere alla chiamata, chiamata quando l'elaborazione del rumore di CVC. Bluetooth versione: V3.0 EDR Class 2. 1 x FM Transmitter. - LCD displayer displays frequency with backlight. - With touch key design, High fidelity stereo. - The length of the USB Charging Cable: 81.0 cm. - Hands-free function makes you more safety during driving. The Griffin iTrip Auto Lightning is specially designed for use with an iPod, iPhone or iPad with Lightning connector. Compatible with all Lightning Devices Including iPhone 5, 5s, SE, 6, 6S, 7, 7 Plus, 8, 8 Plus, iPhone X, XR, XS, XS Max & iPod, iPad. 1 Piece FM Transmitter. - The FM car kit can be easily paired with your phone, transmitting a digital audio signal to your car stereo or other speakers by FM. - Length: Approx. - USB Input: DC-5V. - Plug and play, easy to use, no need for professional installation. Bluetooth version: 4.2 EDR. Bluetooth transmission distance: Barrier-free within 10M. Bluetooth stereo music play. 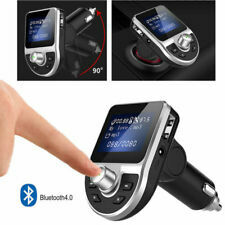 1 x Bluetooth FM Transmitter. Supports Bluetooth auto re-connection when power on. FM transmitter 87.5-108.0MHz. 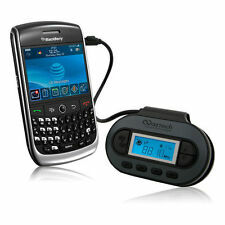 With a support of FM channels, this car MP3 wireless FM transmitter lets you enjoy your phone music when driving. 1 Car player FM transmitter. 180 degrees rotatable body, easily fits most car. 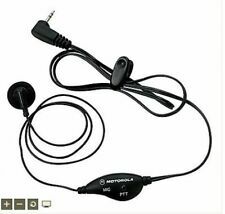 Plug the MP3 player into cigarette lighter of your car directly, easy to use and carry. 1x Transmitter set. It can be hands free with any compatible Bluetooth enabled devices. Bluetooth version: JLIC. Battery: built-in lithium battery. Support music play back from USB and SD card. Music format: MP3, WMA. Eingebautes Mikrofon mit Geräuschunterdrückungstechnologie für ein klares Freisprechen während der Fahrt. - Ausstattung: Für Apple & Android-Handys, Tablets und andere Geräte mit Bluetooth. - Plug & Play, einfach zu bedienen, keine professionelle Installation erforderlich. The Bluetooth FM Transmitter Receiver Car Kit is designed to provide a simple hands-free solution for answering and receiving phone calls while on the go. Also stream stereo music from your smartphone, tablet or other Bluetooth capable devices.